Has anybody ever had a sicker guitar sound than Davie Allan? It's the first thing you hear on the soundtrack album for The Hellcats, a biker movie from 1967 that was also fodder for an episode of Mystery Science Theatre 3000. You can watch it get the MST3K treatment here! It's also the 265th Soundtrack of the Week. The first track, "Hellcats" by The Arrows, is an extremely heavy instrumental rocker of dazzling illness. This is followed by another instrumental, "The Angry Mob", which is more normal and easy-going though enhanced in places with some of that crazy guitar sound. Most of the music on the record is by a band called Davy Jones & The Dolphins. Apparently this is not the Davy Jones from The Monkees (nor is it a pre-Bowie David Jones). "The Only Way To Fly", is a sunny pop song with some cool fuzz guitar. "Hellcats" is the vocal version of the instrumental first track, much friendlier than The Arrows' version. "Mass Confusion" is an upbeat number that sounds rather cheerful about being confused. "Let's Live a Little" has a brisk but stalking bass line and the usual lyrics about tortured love. "Listen to the people telling us what to do / 'cause they don't understand the love that we have is true." The last Dolphins number is "I Can't Take a Song", a soul-influenced song. 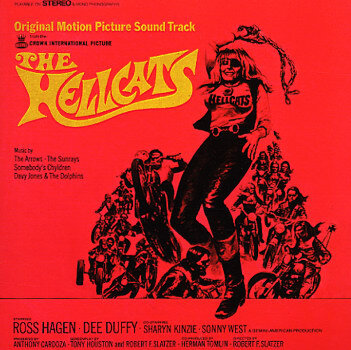 Another vocal take on "Hellcats" is provided by a band called The Sunrays, who have a horn section with them. The remaining two songs are by a group called Somebody's Chyldren. "The Marionettes" is an interesting quasi-psychedelic song with piano making it atmospheric. "I'm Up" is another catchy pop/garage song with some impressively fluid guitar playing.